First of all, Mr. Reinhart, are you cheating on us? Because in spite of the name, this bread includes a small ratio of wheat flour and, though included in the sourdough section of The bread baker's apprentice, it carries normal bread yeast too. Reinhart, you should be punished... :-). This is a 2-3-day bread, since it requires a sponge that needs to sleep in the fridge overnight and the second fermentation is retarded in the fridge too. I made the bread in two days because my kitchen was very warm and the second fermentation was really speedy... so much that the bread overfermented while waiting for my bloody oven to get the right temperature. Pathetic. When I'm rich I will revamp my kitchen and install a professional 90 cm oven that reaches at least 1000 ºC in the shade, a volcano of an oven. But you're wondering, I know... if the bread came out wrong, why is she posting it? Because you can learn from my errors, be patient. And I can do it better next time if I record all my mistakes now. And because in spite of everything the taste was delicious. 100% rye sourdough bread from "The bread baker's apprentice"
Prepare the sponge. Mix all the ingredients and add some water if needed to make a ball. The ball must be firm, not very sticky. Just mix, don't knead it very much. Oil a bowl, put the ball in, turn it for all its surface to oil, cover with some plastic film and leave it to ferment until doubled. Once fermented, leave it in the fridge overnight. Prepare the soaker by mixing the flour, seeds and water. Put some plastic film on it and leave it overnight at room temperature. According to Reinhart, the soaker helps condition the grain and allows for the enzimatic activity to develop, so that more sugar in the flour is released. Now, did you already get up and do you have your soaker and sponge at hand and ready? Reinhart recommends to cut the sponge in a few pieces and leave it at room temperature for a while for it to temper more easily. I didn't do it because of the heat in my kitchen and because I'm an unruly girl. Mix everything (adjust the amount of water according to the dough consistency) and knead by hand for 4 or 5 minutes, a bit shorter if you use a mixer. Put the dough in an oiled bowl, cover with plastic film and let it double its volume. Mine took only two hours and a half. Once the dough has doubled, tip it on the counter and shape two bâtards, trying not to degass too much. I preferred to put all the dough in a loaf pan. So I left it to double and that was my main mistake... I went away to another room and forgot about it. I thought it would take at least one hour more and it didn't. At this point you can also put the wrapped bread into the fridge and leave it to proof overnight. The thing is that when I went to have a look at the bread it was nearly doubled in size and then I immediately turned on the oven and had to wait for it to reach the righ temperature. At some point I thought I couldn't wait any longer because I didn't have the guts to see my bread sinking to the bottom of the pan and then I put it in the oven when it had barely reached 200 ºC (Reinhart advises to start the baking at 260 ºC, spray water in the oven several times after putting the bread in and then go down to 230 ºC). In short, I tried to do my best. 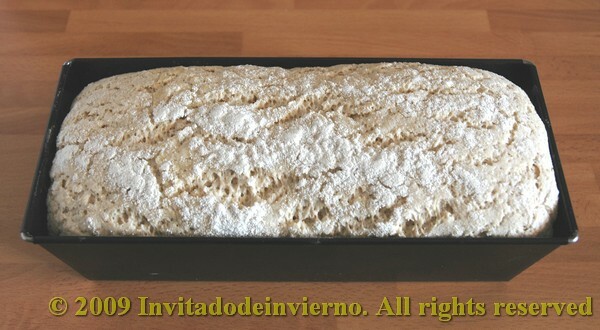 As can be seen in the pictures, the bread had no oven spring at all. It even sunk a little bit because of the overfermentation, and the crust was a bit too hard because of the longer baking at a low temperature. It took 40 minutes to bake, when the advised time is less than 30. 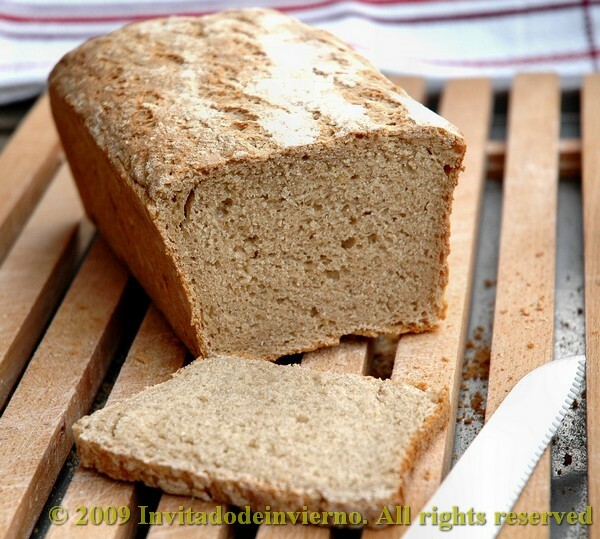 Enhorabuena por tu pan y saludos!!! Sr. Andrés: vale, le perdono, pero que no se repita... XD, gracias por la visita, bienvenido! 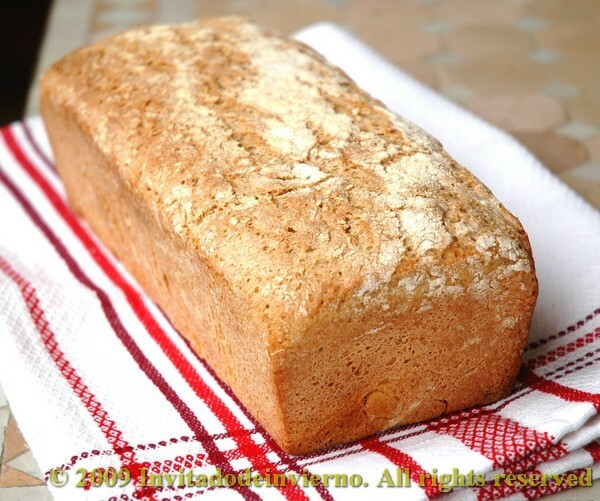 Wow it looks amazing, I absolutely love bread, specially home made. And if they happen to be healthier even better. Welcome back! Your post is so funny, unruly girl, but honestly I think the bread looks perfect and I wouldn't have expected much oven spring from this much rye. The crust is so lovely and crackled, just as it should be! Thanks Susan! True about the oven spring, it seems I can't get used to the rye breads hardly springing. Thanks Jackie! I think I will.